Whether you come from a home bursting with siblings or are an only child, fraternities give you the opportunity to build life-long family bonds with your chapter brothers. One of the ways your chapter does this is through family trees. Believe it or not, family trees are an important part of fraternity chapter management. When you first heard about the concept of big brothers and little brothers, it might’ve sounded kind of gimmicky, and a little corny, if you’re being honest. At first blush, a family tree seems like something that would be much more important to sorority women than to you and your brothers. You’re not very good with crafts and “feelings.” And if you are in touch with your inner artiste, you’re not about to start sharing your glitter and scrapbooking materials. Have your brothers ever set foot in a Michaels? Crafting is expensive! Yet if you’ve been a brother long enough, you’ve learned that these first impressions of family trees are superficial and often flat-out wrong. In reality, glitter has little to do with fraternity family trees--unless you want it to. In that case, glitter away. Big brothers and little brothers (called “pledge sons” in some chapters) forge a bond tighter than with other chapter members. They build their own traditions and rituals. They have each other’s backs through thick and thin, and they’ll turn to each other first in times of need. They may not be biological brothers, but for fraternity men this is as close as it gets. Perhaps you still think sororities are the only ones who should care about their big sister-little sister reveals. Your big probably isn’t going to bake you a cake welcoming you to the family. Yet the moment you become a little is the moment your life as a fraternity brother changes forever. 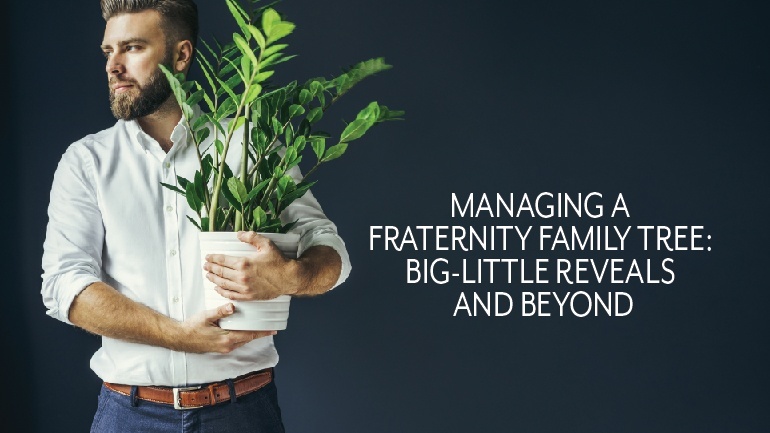 OmegaFi wants to guide you through the rewarding process of Managing a Fraternity Family Tree: Big-Little Reveals and Beyond. If you’re taking on any little brothers this semester, think long and hard about how to get the most out of your family tree. Don’t simply pick your little like you’d select players for a pick-up basketball game. Just because they can help you look good in intramurals with their 3-point percentage, it doesn’t mean they’d make the right little for you. The first idea you should throw out the window is that you’re going to pick a little you’re already best bros with. There’s that guy you basically talked into rushing, who you vouched for when it came time to drop bids. Unless you’re in a smaller chapter and don’t have a choice, or need to take on multiple littles, don’t pick that guy. Let us repeat ourselves: Don’t. Pick. That. Guy. Fraternity chapters aren’t cliques. They’re brotherhoods. It’s a huge distinction, and it makes a massive difference in how your chapter grows and thrives. Go for a little brother you think you’d get along with and who’s shown a strong work ethic as a new member. Pick someone you don’t know super well already, but whom you’d like to get to know better. The goal is to build a family tree of brothers with diverse personalities and interests, who grow into a family through a shared interest in chapter success. No two branches form exactly alike, but they all give and receive strength from the same tree. Managing the “reveal” part of a big brother’s relationship with his little brother, honestly, is just as important for fraternities as it is for sororities. It’s probably not going to include all the cute gestures of affection sisters typically show their bigs and littles. But there’s something sorority sisters get fantastically right with big-little reveals: the art of reinforcing tradition. Sisters aren’t just throwing sparkles at everything and seeing what sticks. Ask a sister to go into any depth at all about her reveal, gifts, family shirt designs or anything else, and you’ll quickly discover an elaborate world of symbolism and shared familial values. You’ll see the backbone of any Greek organization worth joining--members building their own future on the solid foundation of the past. Take these sisters’ lead and build your own enriching family traditions. Just make sure those traditions fit with the chapter’s existing values, and that you aren’t hazing or breaking any other safety regulations. Share a family meal at a steakhouse. Include little brothers in family secrets and rituals. Introduce them to grand bigs and great-grand bigs going all the way back to those who’ve graduated. This is a great way to keep alumni active in their fraternities. Help little brothers understand their lineage, and how that lineage fits into the bigger tradition of your chapter and national fraternity. A reveal will never be as big a deal for some brothers as it is for most sisters, but every brother can find a way to brand tradition into their growing family. Just as the president is the executive manager of your chapter, as a big brother you must become the executive manager of your family tree. Sorry, no--you don’t get a bigger room in the chapter house. You don’t get a special parking space or any of the other privileges your pres enjoys. Yet you still must shoulder the responsibility of guiding your little brothers. Help them become more successful students, stronger brothers and better men. Don’t coddle them. Sometimes managing your family tree requires tough love. Teach them to stand on their own and then stand by their side. That’s what being a fraternity brother--and a big brother--is all about. When managing your fraternity family tree, what techniques have worked for you? Are there certain factors you consider when taking on a little brother, or conversely, picking a big brother? Does your chapter have shared traditions for big brother night, or do you stick to your own traditions? Let’s talk family in the comments below.